An international team of ecologists and social scientists has shown in a new study published 3 March in the journal Science that tree species domesticated and distributed throughout the Amazon basin by indigenous peoples before 1492 continue to play an important role in modern-day forests. 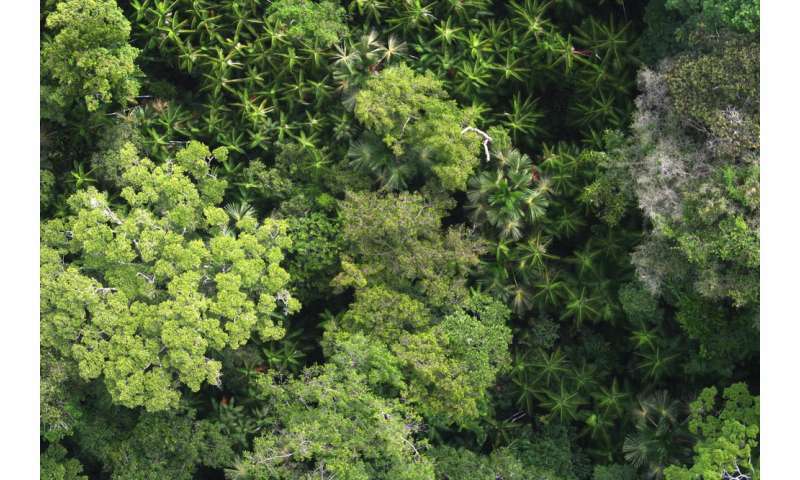 These new findings strongly refute the idea that Amazonian forests have been largely untouched by humans. The study was led by Carolina Levis, a PhD candidate at Brazil's National Institute for Amazonian Research (INPA) and Wageningen University and Research Center in the Netherlands. "For many years, ecological studies ignored the influence of pre-Colombian peoples on the forests we see today. We found that a quarter of Amazonia's domesticated species are widely distributed in the basin and dominate large expanses of forest. These results clearly indicate that the Amazonian flora is in part a surviving heritage of its past inhabitants," says Levis. 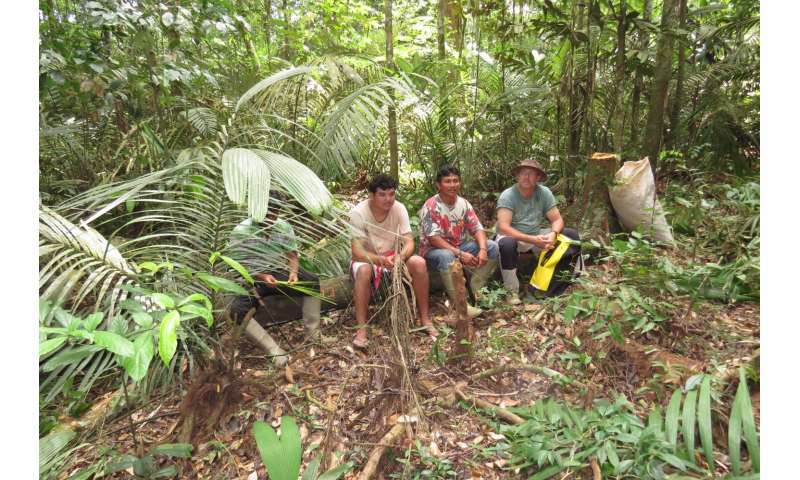 The team made the discovery by overlaying data from more than 1000 forest surveys of the Amazon Tree Diversity Network on a map of more than 3000 archaeological sites across the Amazon. By comparing forest composition at varying distances from archaeological sites, their analysis generated the first Amazon-wide picture of how pre-Colombian peoples influenced Amazonian biodiversity. The study focused on 85 tree species known to have been domesticated by Amazonian peoples for food, shelter, or other uses over the last several thousand years. The researchers found that throughout the Amazon basin these species were five times more likely to be common in tree surveys than non-domesticated species. Domesticated species were also found to be more common and more diverse in forests closer to archaeological sites. These 85 domesticated trees include well-known commercial species, such as cacao, açaí, and Brazil nut. "The finding promises to heat up a long-simmering debate among scientists about how thousands of years of human occupation in the Amazon basin have influenced modern-day patterns of Amazonian biodiversity, and challenges the view many of us ecologists had and still have of this huge area," says Hans ter Steege, of Naturalis Biodiversity Center and coordinator of the Amazon Tree Diversity Network. The immense size of Amazonian forests has historically hampered archaeological research and given the impression of an untouched landscape, but a large number of new archaeological sites have been discovered in recent years. "This lays to rest the long-standing myth of the 'empty Amazon'," says Charles Clement, senior researcher at INPA, Manaus, and a coauthor of the study. "Early European naturalists reported scattered indigenous populations living in huge and apparently virgin forests, and that idea has continued to fascinate the media, policy makers, development planners and even some scientists. This study confirms that even areas of the Amazon that look empty today are crowded with ancient footprints." The study also pinpointed regions of the Amazon that today concentrate especially high diversities and large populations of domesticated species. Southwestern Amazonia, where large stands of Brazil nut trees remain a foundation of local residents' livelihoods, is one such example. In other regions, like the Guiana Shield, domesticated species are less well represented, and the relationship between domesticated species and archaeological sites is less clear, highlighting the need for more research on the history of Amazonian occupation. The degree to which the recent history of Amazonian settlement has affected the distribution and abundance of domesticated species in the Amazon basin also remains to be studied. While the relatively small number of domesticated tree species used in the study was sufficient to reveal a strong human signal in modern forests, the authors point out that the signal may be even stronger than they documented, since hundreds of other Amazonian tree species were also managed by pre-Colombian peoples but not domesticated. Untangling the complex interplay of historical, environmental, and ecological factors structuring approximately 16,000-species Amazonian tree flora remains a focus of the team's work. The question is pressing, since both types of pre-Columbian heritage—archaeological sites and forests with a strong historical component—are at risk from deforestation, degradation, roadbuilding, mining, and other threats. "Domesticated tree species are still vital nowadays for the livelihood of Amazonian peoples", says André Junqueira, a Post-doc at Wageningen University and Research Center and a co-author of the study. "Results of this study have important implications for conservation. We have shown that the southwestern and eastern regions concentrate the most domesticated species, and these are the regions where most forest degradation and loss is occurring. Southwestern and eastern Amazonia may not be considered classical biodiversity hotspots, but should be top conservation priorities as reservoirs of high value forests for human populations," says Flávia Costa, researcher at INPA and a co-author of the study.